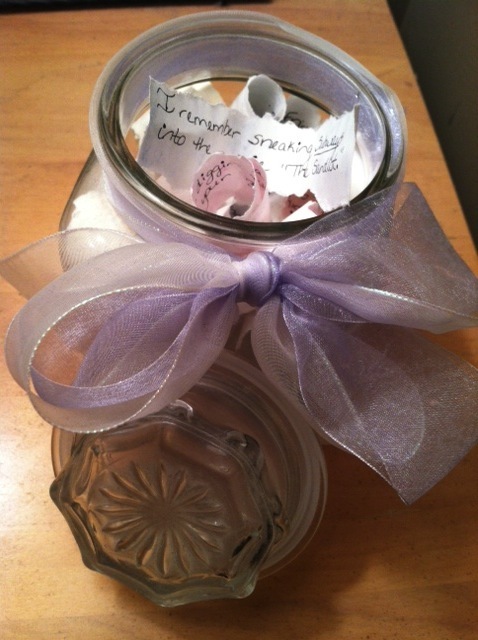 Years ago, I gave a dear friend a memory jar gift. In a recent conversation over the idea of word gifts, she mentioned that she keeps that jar beside her bed and reads one of the memories hidden within it each day. That gift was given YEARS ago! Its encouragement and value has not waned throughout the years. Now that’s the kind of gift I’d like to receive but definitely one that I love to give. A memory jar is extremely simple to make. First, purchase some kind of jar – one that is appropriate for the receiver. If it’s a child, make it a colorful jar. If it’s a male, be sure it’s not to feminine (such as the one above with a pretty purple bow.) Of course, if it’s a female who will be receiving the gift, go as girly as you want! This is a long-term gift, one meant to be treasured over a period of time. Try to come up with at least 30 memories shared, so that the receiver can enjoy the gift for a month. This means they get to read one memory a day for a month. Here’s a simple poem to write on the card that could be given with the gift so the beneficiary knows exactly how to enjoy it. Is a colorful mosaic of blessing. What’s one moment of life you experienced with someone special would you give $100 to relive? Great idea on the memory jar! Love your blog even more each day. You are so creative! Sitting on the couch with my dad watching football on a Saturday afternoon. He taught me what “off sides and clipping” meant at the same time he was teaching me to cross stitch. 🙂 Such a precious memory, that I would do anything to be able to relive. How sweet is that! I still have the baby blanket that you cross-stitched for me.